Three types of the geometry can be optimized: the most stable (minimum energy) geometry, conical intersections between the electronic states, and the transition state geometry (or the saddle point on the potential energy surface). In the optimizations, rather than using the exact Hessian, one can start using the approximate Hessian and update it according to the step taken. The advanced quasi-newton optimization methods, eigenvector following (EF) algorithm and rational functional optimization (RFO) are implemented. In the minimum energy conical intersection (MECI) optimization, the molecular gradient is replaced by the sum of the energy difference gradient and the upper state gradient after projecting the degeneracy lifting vectors out (gradient projection). The minimum distance conical intersection (MDCI) can be also optimized by replacing the upper state gradient in MECI optimization with the distance vector to the reference geometry. In addition, the minimum energy path to the reactants and products from the saddle point can be calculated using the second order algorithm, without mass weighting. The optimizer in BAGEL has been interfaced with an external molecular mechanics program, TINKER, using which mixed quantum mechanics/molecular mechanics (QM/MM) optimization can be performed. To perform this, the TINKER input files (keyword file tinkin.key and initial coordinate file tinkin.xyz) should be provided in tinker1 and tinker2 subdirectories, respectively. The testgrad program in the TINKER package should be installed in $PATH. Note that the use of the internal coordinate is not supported in the QM/MM case, or more generally when there are external charges. The output contains the gradient evaluation progress at the first step of the optimization, and the status of the optimization. The other information, including the quantum chemistry calculations at the optimization steps, are deposited in the file opt.log. The history of the optimization and the final geometry are also saved in the MOLDEN files opt_history.molden and opt.molden, and can be read by MOLDEN. Description: Type of the optimization calculations. energy: find the most stable geometry. conical or meci: find the minimum energy conical intersections, according to gradient projection method. mdci: find the minimum distance conical intersections, according to modified gradient projection method. transition: find the transition state geometry (saddle point on the PES). mep: find the minimum energy path using the second-order algorithm, starting from the transition state geometry. Description: The target state to optimize. 1: the first excited state, and so on. Description: The second target state to optimize in the conical intersection optimization. Description: The method array allows the user to specify one or more methods to be used in the Hessian calculation. See section on input structure for more information. Description: Maximum component of the gradient in Hartree / Bohr. Default: 0.00001 (atoms in the molecule < 4); 0.0003 (larger). Description: Maximum component of the displacement in Bohr. Default: 0.00004 (atoms in the molecule < 4); 0.0012 (larger). Description: The energy change in Hartree. Description: Algorithm for the optimization calculations. rfo: Rational functional optimization algorithm. Recommendation: use either “ef” or “rfo”. Description: Maximum step. The unit is in the specifed coordinate. Default: 0.3 (energy optimization); 0.1 (otherwise). Description: Use internal coordinate or not. Default: true, except when QM/MM is used (false). Recommendation: use default when you have a single molecule. If bond-breaking process is in consideration, use “false”. Description: Use redunant internal coordinate or delocalized internal coordinate. true: use redundant internal coordinate. false: use delocalized internal coordinate. Description: Maximum number of iteration for optimization. Description: Maximum number of Z-vector iterations for gradient evaluation. Applies to SA-CASSCF, CASPT2, and MP2 calculations. Recommendation: increase the value when the Z-vector equation does not converge. Description: Add explicit bonds between non-bonded atoms. false: do not add explicit bonds. Recommendation: use default unless you are optimizing two molecules. Description: Specifies the explicit bonds. See below for example. Description: Delta x for numerical gradient. flowchart: use flowchart update. This automatically decides according to the shape of PES. Description: Use approximate Hessian for the initial step of the optimization. false: calculate numerical Hessian first, and start the optimization using the Hessian. Description: Use adaptive stepsize in RFO algorithm. true: use adaptive maximum stepsize. false: use fixed maximum stepsize. Default: true (algorithm is RFO); false (otherwise). Description: Generate a Molden file at each geometry step. Default: false (do not generate). Description: Type of non-adiabatic coupling matrix element to be used. full: use full nonadiabatic coupling. etf: use nonadiabatic coupling with built-in electronic translational factor (ETF). noweight: use interstate coupling without weighting it by energy gap. Description: Thiel’s C_3 parameter, which is multiplied to the full gradient. Default: 2.0 (MECI) or 0.01 (MDCI). Description: Thiel’s C_4 parameter, which is multiplied to the gradient difference. Description: Specify reference geometry used in MDCI optimization. true: specify reference geometry in the refgeom block. false: the first geometry for optimization is considered as the reference geometry. Description: Reference geometry for MDCI optimization. The format is the same as the molecule block. Description: Direction of the MEP calculation. 1: use the direction of the lowest eigenvector. -1: use the opposite direction of the lowest eigenvector. Recommendation: run two calculations with “1” and “-1” to get the full path. Description: Do QM/MM energy optimization. false: do gas phase optimization. Description: Molecular mechanics program to do QM/MM. tinker: do QM/MM optimization with TINKER. This optimizes the ground state geometry of benzophenone. 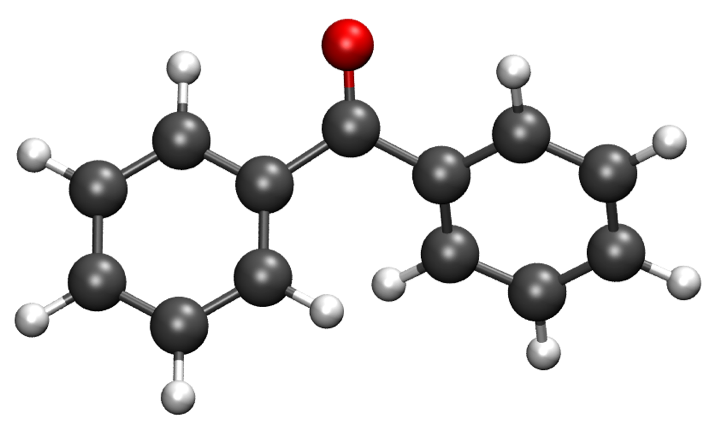 The benzophenone molecule with carbon atoms in grey, oxygen in red, and hydrogen in white. Using the same molecule block, a geometry optimization with XMS-CASPT2 can be performed. In this particular example as is often the case, the active keyword is used to select the orbitals for the active space that includes 4 electrons and 3 orbitals. Three sets of \(\pi\) and \(\pi^*\) orbitals localized on the phenyl rings are included along with one non-bonding orbital (oxygen lone pair). The casscf orbitals are state-averaged over three states. Since a multistate calculation is performed, the user must specify which state is to be optimized (the target). In this example, we optimize the ground state. This optimizes the ground state geometry of a benzene dimer using MP2. The internal coordinates complemented by two explicit bonds between the carbon atoms in the monomers are used. Eigenvector following algorithm J. Baker, J. Comput. Chem. 7, 385 (1986). Rational functional optimization algorithm A. Banerjee, N. Adams, J. Simons, and R. J. Shepard, J. Phys. Chem. 89, 52 (1985). Second-order minimum energy path search C. Gonzalez and H. B. Schlegel, J. Chem. Phys. 90, 2154 (1989). Gradient projection algorithm M. J. Bearpark, M. A. Robb, and H. B. Schlegel, Chem. Phys. Lett. 223, 269 (1994). Flowchart method A. B. Birkholz and H. B. Schlegel, Theor. Chem. Acc. 135, 84 (2016). ETF in nonadiabatic coupling S. Fatehi and J. E. Subotnik, J. Phys. Chem. Lett. 3, 2039 (2012). Thiel’s conical intersection parameters T. W. Keal, A. Koslowski, and W. Thiel, Theor. Chem. Acc. 118, 837 (2007).